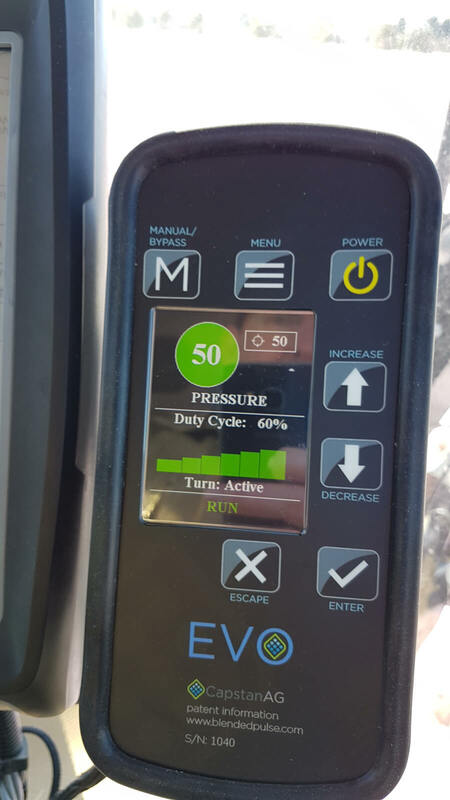 Many operators use budget pressure gauges on their sprayers and have never changed them or tested their accuracy. 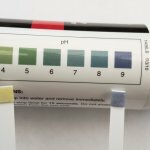 This makes assessing sprayer performance and output difficult. 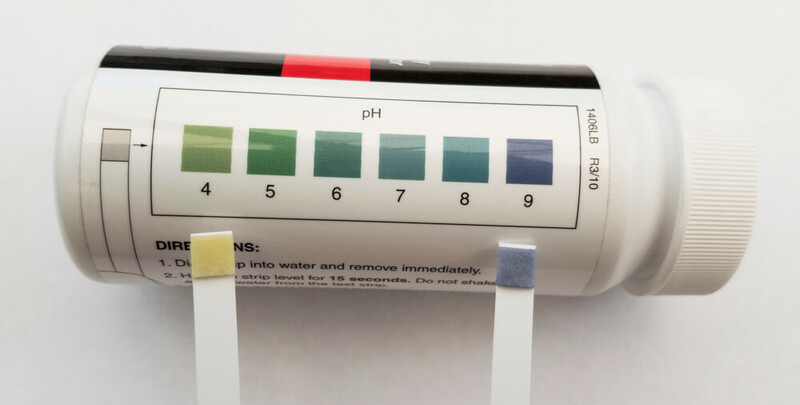 Sprayer performance has a direct impact on coverage, efficiency, and efficacy because a faulty gauge may cause you to spray more or less product than you intended; read more here. 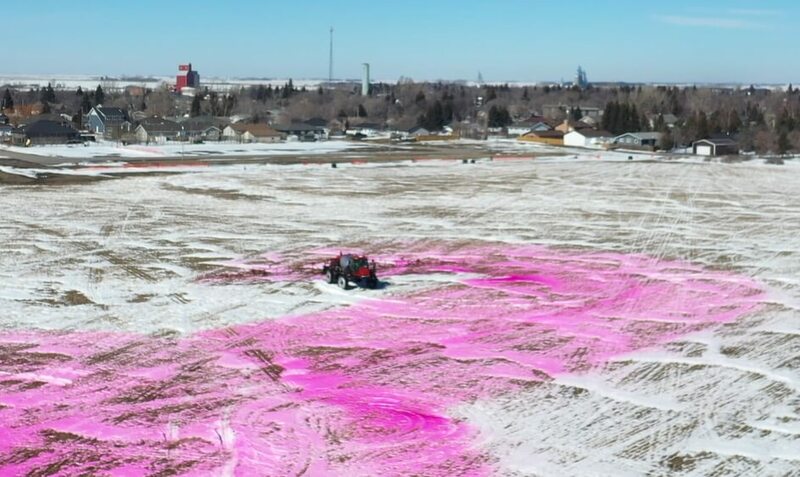 Spraying more product means wasted product and money, and potentially higher residue levels. 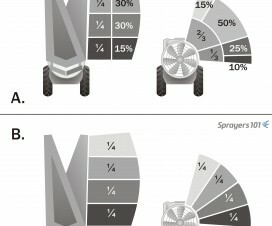 Conversely, spraying less than intended may lead to compromised spray coverage. The Pressure Gauge Tester. 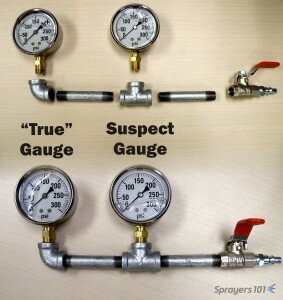 The “true” gauge is in the elbow and can be compared to the suspect gauge in the tee. Concept from K. Voege, Ontario. Sometimes a gauge is not obviously in need of replacement. Suspecting an issue, some operators will simply go out and buy a new gauge. However, even brand new gauges can be inaccurate right off the shelf. In order to test any gauge you need to apply a known pressure to see if it is reading accurately. †Test gauge range should match your existing gauge. 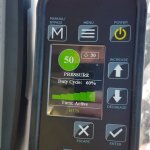 Sprayer gauges should be twice as much as your typical operating pressure. An older Hardi cannon sprayer used in an ornamental nursery. The nozzles are clustered with seven nozzles on top, four in the middle, one below. 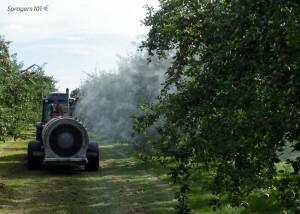 The settings on this manner of sprayer are relatively inflexible, making it difficult to control where the spray goes. 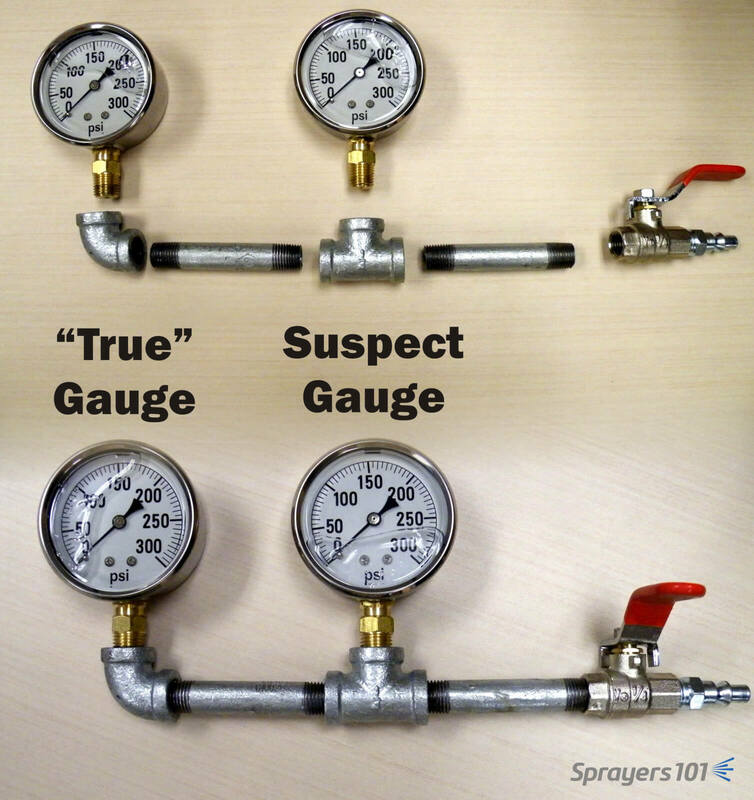 Another way to confirm that the main pressure gauge is accurate is to install a second oil-filled gauge (that has been tested) in-line beside the main pressure gauge at the regulator. This may not be possible with some sprayers. 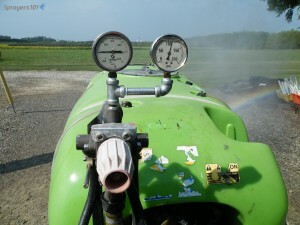 Some newer Durand-Wayland sprayers have a gauge located near the pump, under the chassis where it is not visible from the tractor. Others inset the gauge into the side of the tank with no room for a second gauge. Two gauges keep each other honest – this GB (Italian-made Good Boy) is sporting a home-made assembly that cost ~$50 to assemble, including the second gauge. The silver spray paint on the black pipe prevents rust and makes it look pretty darn sharp. 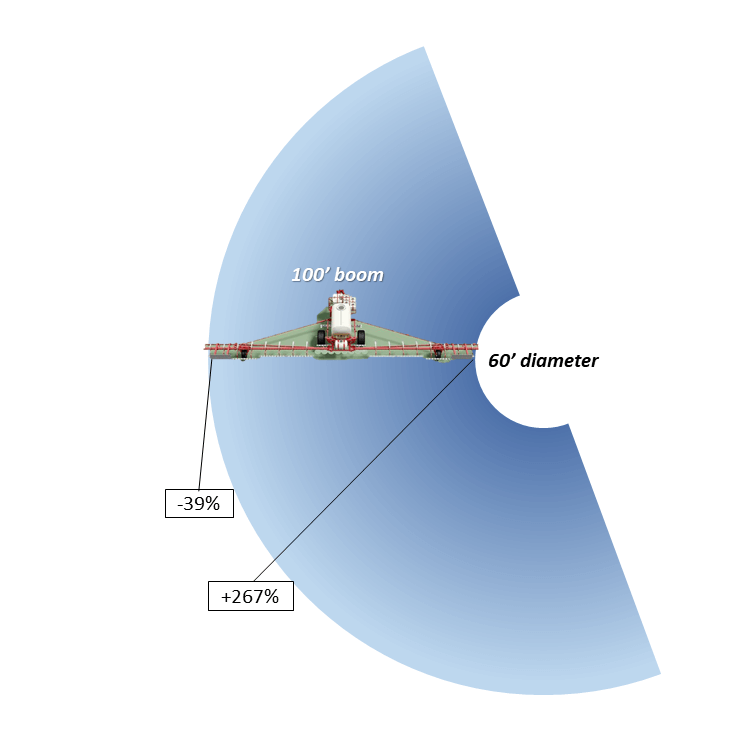 Pressure in the booms is often less than the desired operating pressure and must be accounted for (a phenomenon known as “pressure drop”). This is a function of hose diameter, host fittings, and on tower sprayers it includes the distance the spray travels between the pump and the nozzles. Dress appropriately because you’re going to get wet performing this diagnostic. Fill a clean sprayer about half-full with water. 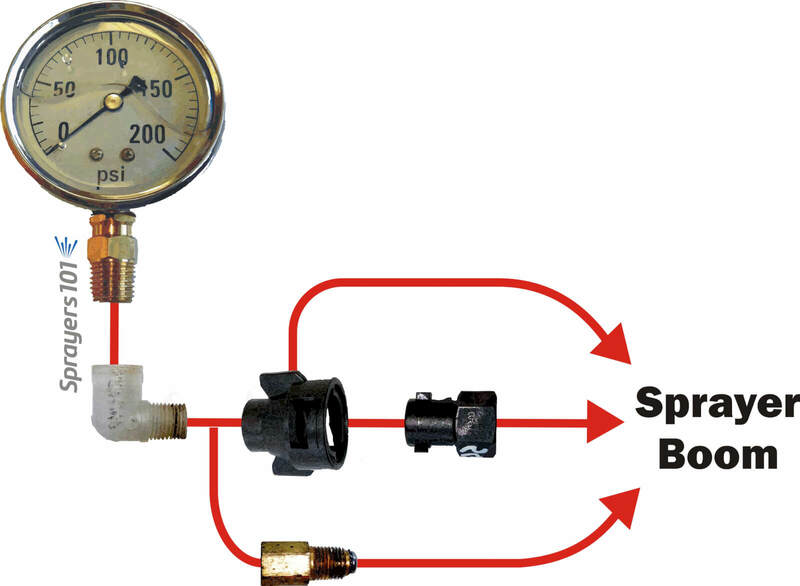 Install an oil-filled pressure gauge in the highest nozzle position of one of the two booms; the nozzle cap or entire nozzle body may need to be removed for this step. For Metric fittings, contact your sprayer dealer – they can be hard to find. 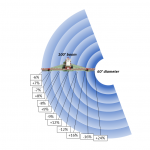 With the tractor parked, bring up the rpms to get the lines to the desired operating pressure. 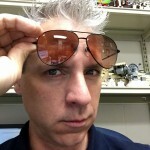 Open the booms and compare boom pressure (at the nozzle) to your desired pressure. All nozzles should be open during this test – that means both booms. For positive displacement pumps, adjust the main pressure regulator until the gauge on the boom reads the desired pressure. For centrifugals, it is possible to make small changes to the pressure, but more important to note any pressure differential for later considerations regarding nozzle output and spray quality. There are many ways to install a gauge onto a nozzle body. Here are three examples of common fittings. When sprayers that employ a positive-displacement pump are switched from double to single boom operation (e.g. when border spraying or during turns), the pressure can change considerably. Most units will experience a pressure increase, thereby increasing the boom output. 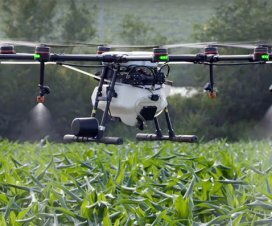 Spraying from one boom. This operator checked to make sure the pressure didn’t increase when he closed the second boom. High pressures or sudden spikes could indicate a faulty regulator valve. This problem can be greatly reduced by matching the regulator spring to the operating pressure and by properly sizing the regulator to the pump volume. 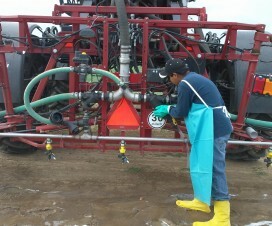 Many sprayers come equipped with regulator springs matched to the maximum pressure range of the pump (often 600 – 900 psi). 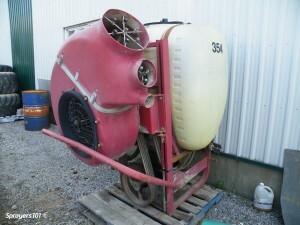 These springs are unable to control the pressure down at 100 – 200 psi, where most Ontario airblast sprayers operate; they are so stiff the liquid pressure is unable to act on the spring and the valve essentially acts as a flow control (throttling) valve rather than a pressure control valve. Liquid pressure is difficult to control using a throttling valve: it is unable to compensate if the tractor engine speed drops while driving uphill and sprayer output is subsequently reduced. 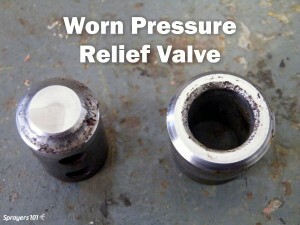 Further, this phenomenon can cause pressure gauges (which should be matched to your normal operating pressure to spike. 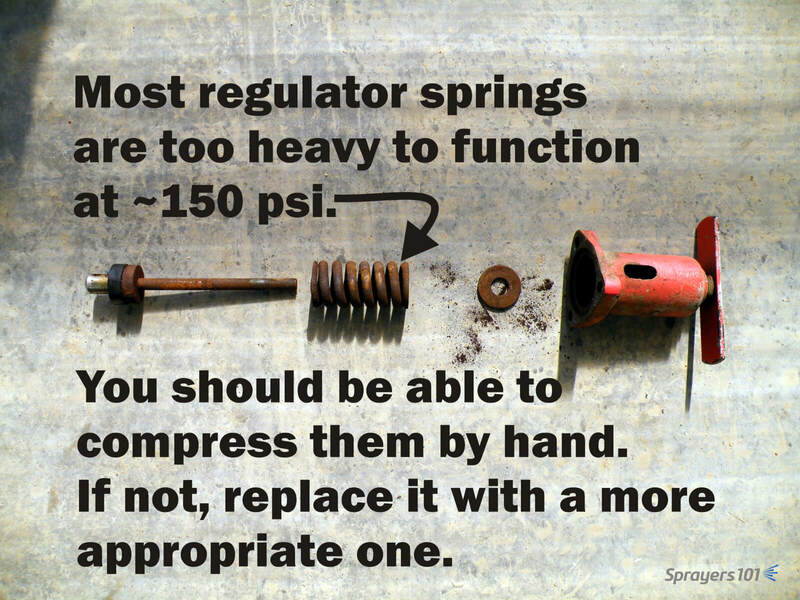 Valve springs and seats wear out, such as in this regulator assembly. Check yours each season. With PTO at application speed and both booms open, adjust regulator to calibrated operating pressure. If pressure increases, open throttling valve to achieve calibrated operating pressure. If pressure decreases, close throttling valve to achieve calibrated operating pressure. Repeat process for the other boom, and find a compromise position for the valve. Some operators elect to remove the handle from the Turbomist throttling valve once it is set so they don’t accidentally bump it later. That’s fine, but don’t lose it. Further adjustment may be required when transitioning between dilute and concentrated volumes.